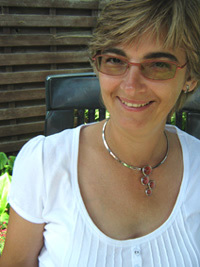 My name is Tania; born in 1965 and since my childhood, panting and drawing have been my passion. A dream came true when my parents finally agree to let me start at he high school for fine arts. I was so happy, but unfortunately a few months later my dream was over because my parents decided to emigrate to Spain and I was forced to learn all about tourism and hotel management. I was not pleased with my situation until somebody told me about Flamenco dancing classes which I fell in love with. A few years later my teacher asked me to join the group who represented the school on major events and dance festivals. Now I had to rehearse five days a week. I did not have any time left for drawing or painting. I met my future husband and after a while we decided to move back to Belgium and build our future there. The first thing I did was search for Flamenco dancing classes, but unfortunately for me, at the time, they were only given in Antwerp. So the drawing and painting gear became my best friends again. In ‘94 I became mother of twin daughters and during the first years all my care, and most of all, spare time went to them. In the mean time I also became licensed radio ham operator with a staff function, and again it took a lot of my free time, still this was not enough for me and I went to the library looking for something artistic. I tried a lot, but was never satisfied until I came in touch with doll sculpting. In the summer of 2004 I gave it a try. My first doll didn't last long because of the bad type of clay I used. After searching on the Internet and using another type of clay the result were more satisfactory. I'm able to teach myself by combining a lot of techniques, learning every time more and more out of my mistakes. It's always a victory to see that the new sculpture is better then the one I did before. I hope this story may convince you to try out this wonderful hobby, I only can speak for myself, I'm sorry I didn't discover this beautiful hobby earlier!